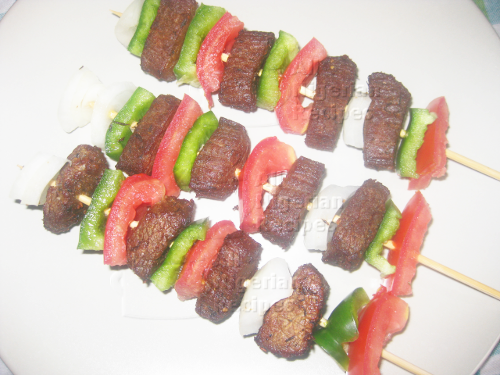 Beef Skewers are very easy snack recipes to make. Some call it Beef Kebabs or simply Stick Meat. This is also one of the best snacks to entertain your guests with. The following are the ingredients I use to make my Beef Skewers. Feel free to use any vegetables you like. The aim is to make your beef skewers look colourful. So use vegetables with contrasting colors. For instance you can use red bell peppers instead of tomatoes. But whatever you do, please include onions because it tastes good with the fried beef. Cut the beef into small rectangular cuboids and place them in a bowl. Add the thyme, pepper and stock cubes. Mix everything by hand, rubbing the seasoning into the beef. When done, cover and place in the fridge to marinate for about 1 hour. Wash all the vegetables and remove the seeds from the green bell pepper and tomatoes. Cut the vegetables into medium rectangles and set these aside (see video). After about 1 hour, bring out the marinated beef and place in a pot. Add a few drops of water to help with the simmering, cover and start cooking at medium heat. Once the underside turns pale, flip the beef pieces to cook the top side as well. You don't need to do this if you are cooking a full pot of beef. When the top side turns pale, flip the beef pieces on any other sides that are still red, cook these till all the beef looks pale. Now, start stirring the beef constantly till all the water is absorbed. You don't want to lose any flavour by pouring away the beef stock. Add salt to taste and set this aside. In a different pot, heat some vegetable oil. You need at least a depth of 3 inches of vegetable oil. When hot, fry the beef pieces till brown and dry. Remember to stir constantly while frying so the pieces will brown evenly. When done, put the beef pieces in a sieve lined with paper towels and leave to cool. When cool, thread the fried beef and vegetables one after the other onto the beef sticks. The way you combine the beef and vegetables is entirely up to you but make sure the final product looks colourful and appetizing. You are done! Serve with a chilled drink.